Ace Cruz graduated from USC film school with BFA degree in Drama. After graduating from College he started to produce stage plays he acted in. He has produced and acted in numerous stage plays and feature films. He has dedicated his life to the arts. His strongf leadership and ambition to succeed lead hum to open up his own production companmy Spirit Films. He believes in integrity, honesty, peace and harmony. He is an avid mediator. He believes one should be in a peaceful place at all times to find creativity and happiness from within. He spends most of his time in developing being in the moment. He has worked with famous actors like : Michael Madsen, Natasha Lyonne, Lee Majors, Michael Berryman, Sam Jones, Michael pare, Phillipp Michael Thomas, Kathleen Kinmont, Todd Bridges, Joe Estevez. uating from College he started to produce stage plays he acted in. He has produced and acted in numerous stage plays and feature films. He has dedicated his life to the arts. His strong leadership and ambition to succeed lead him to open up his own production company, Spirit Films. He believes in integrity, honesty, peace and harmony. He is an avid meditator. He believes one should be in a peaceful place at all times to find creativity and happiness from within. He spends most of his time in developing scripts, raising funds for feature films and practicing being in the moment. Books he likes to read: “The power of now” by Ekhart Tolle, Anthony Robins “Unlimited Power”, Wayne Dyer, Depok Chopra, and any positive motivational books. 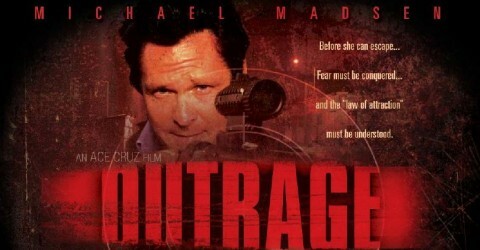 I watched Outrage. The film was made on a very low buget as low as $400,000.00 USD, which is remarkable.. Ace Cruz definitely deserve an applause.